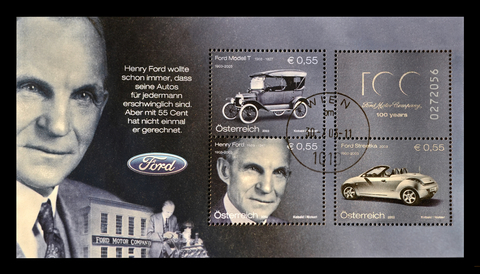 Henry Ford is a name which will forever remain etched into the halls of fame of the automobile industry. His outstanding achievements across business and production to create a product for the masses are foundations upon which all automobile companies function. His work in the theory of processes has wide-ranging applications. Henry Ford was born in 1863 and was the first son born to William and Mary Ford. They owned a farm, which was quite prosperous in Dearborn, Michigan. At the age of sixteen, he left home for the nearby city of Detroit where he found apprentice work as a machinist. He soon returned to Dearborn in three years to work on the family farm, but continued to operate and service steam engines by working occasional stints in factories around Detroit. While he was working as an engineer for the Edison Illuminating Company, Ford built his first horseless carriage powered by gasoline, which he named the Quadricycle. Soon after in 1903, he established the Ford Motor Company, and five years later they rolled out the first car, named simply as Model T. There was initially an overwhelming demand for the new vehicle, which only continued to grow. Ford came up with a unique and revolutionary new production method, which included large production plants, the use of standardized, interchangeable parts, and in 1913, the world’s first moving assembly line for cars. It was the year 1907 when Henry Ford announced his ambition to create a motor car for the masses. At that time, automobiles were expensive and custom-made machines. After the announcement, his engineers took the first step towards this goal by designing the Model T, a simple, sturdy car. The car, first produced in 1908, kept the same design until the very last one in 1927. From the start, the Model T was less expensive than most other cars being produced at the time, but it was still not attainable for the “masses.” Henry Ford soon realized that he’d need a much more efficient method to produce the car at a cheaper cost. He and his team found refuge among four pillars of industrial engineering and Six Sigma. They would be interchangeable parts, the division of labor, continuous flow, and reducing wasted effort. Using parts which were interchangeable meant making every piece of the car the same every time. That way any valve would fit into any engine and any steering wheel would fit into any chassis. This meant that large improvements would need to come into the machinery and the tools used to create the parts. Although once the machines were improved, any laborer irrespective of his/her skills could operate them. This replaced the skilled craftsperson who formerly made the parts, which further aided in cutting the cost of production, a key tenet of Six Sigma. Also, to improve the workflow, the production process needed to be arranged in such a manner that every consequent task should begin the moment one ended. All this occurred within a minimum set up time. Every tenet visited here, starting from the tool improvements to the workflow and process, are inherent in the theories of process improvement. To ensure things were done according to the latest research and theories of process improvement, he hired Frederick Taylor, the creator of scientific management. He had him do studies on time and motion to determine the exact speed at which the work should proceed, down to the exact movements workers should use to accomplish their tasks in the minimum time provided. The ideas of Henry Ford have long been considered as the foundation stones of modern assembly line production. The fundamentals of the area would never have matured to fruition had it not been for the work of Ford. His contributions to the automobile industry can never be forgotten as the quality, cost, and speed of production remain an inherent part of any manufacturing process. The post 1913: Henry Ford and the Moving Assembly Line appeared first on Shmula.